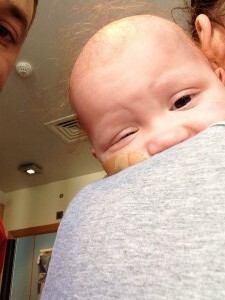 This time last year, Margot appeared to be in a relatively good place. Margot was about one month post bone marrow transplant and things seemed to be headed in the right direction. She had been in isolation for over 5 weeks by this time (when you include the pre-BMT conditioning period) and whilst she had picked up a virus (the Adenovirus) doctors appeared to have this under control. 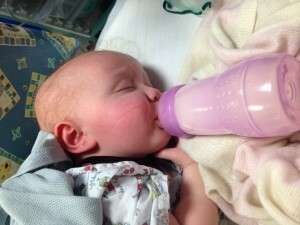 Margot had little or no appetite and consequently, she had been on TPN (Total Parental Nutrition) for a while. This ensures that the patient gets sufficiently nourished via a drip into the bloodstream, but it also means that the esophagus and gut are redundant / aren’t being used and so this in itself can give rise to other issues. Consequently, we tried everything we could to keep Margot drinking and eating regularly – small amounts of food were better than nothing. Every few weeks Margot needed to undergo a bone marrow aspirate. This procedure involves a general anaesthetic and a needle into the hip to remove a bone marrow sample for testing. Blood tests provide one level of testing, but to really understand what’s going on with the leukaemia, the definitive test is the bone marrow aspirate. My private blog post below records what happened on the day that we were told Margot had 100% donor cells in her marrow. 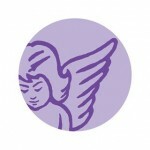 Effectively, this news heralded Margot’s bone marrow transplant as a success. This was the best possible news and it was what we were waiting for. To the extent of the limits of detection, Margot was 100% donor and she was on the road to recovery. Of course, we now know different, but at the time we were so full of hope; it looked like Margot was on the road to recovery. Izabela (AKA “Baba”), Vicki & I worked a rota system which meant that Vicki and I were able to have time at home together and also separately, with the boys. 09:29 I arrive at GOSH to relieve Izabela from her shift. Not a good start to the day ! Margot isn’t happy to see me. Apparently she was in good spirits this morning but now she starts to cry. I think she has just worked out that because Daddy has arrived, Izabela is going to be leaving shortly ! and she is as distressed as I have seen her for some time. Don’t leave me Baba ! 09:39 Dr Louis pops his head in. Test results back from yesterday’s test: the Adenovirus is down to 5,000 copies / ml from 40,000. 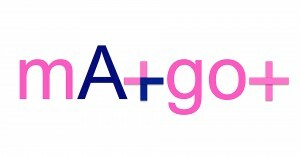 Good ! 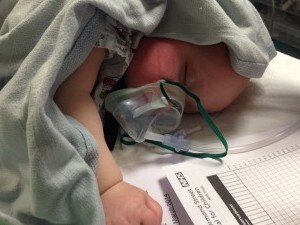 He explains that a new NG tube will go in whilst Margot is under general anaesthetic. It’s good practise to change them from time to time. This is being added to the parental consent form. Bone marrow aspirate today – it’s a big day – and Cidofovir infusion later at 15:00 (to hopefully finish off the adenovirus). 09:47 Nurse Edil administers Vitamin K.
As we handover, Izabela briefs me that Margot is eating little or nothing. She had 20ml of milk before bed, a few Hula Hoops. Not much else other than the milk feeds via NG tube and TPN (Total Parental Nutrition – which is fed intravenously). Margot has been up since 06:00 and is ‘nil by mouth’ pending theatre, so this probably accounts for why Margot is so scratchy. 10:05 Margot into theatre 2. She is crying and in distress : a new room complete with a half dozen new faces and nil by mouth all morning will do that. She goes under and we leave. 10:28 Margot out of theatre and in recovery area. A good sample was obtained. All good. Post op pressure applied to area where procedure occurred because there was some post procedure bleeding. As we arrive it has apparently stopped bleeding already. 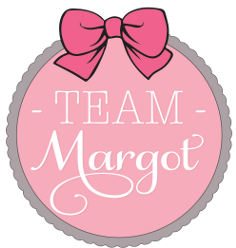 Tests on Margot’s bone marrow aspirate will begin today and hopefully confirm that she is “disease free”. Microscope tests will be undertaken today: morphology. Engraftment & MRD tests to follow. 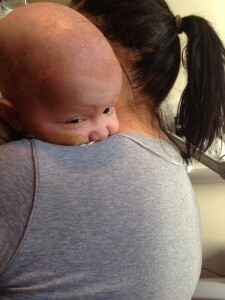 Margot’s new NG tube dressing is infringing over her left nostril and needs a trim. 10:53 portable monitor hooked up and we leave the recovery area and head back to Robin ward. 11:08 back in the room, Obs done & Margot starts to dose but Izabela leaves before she is asleep and this sparks a major upset. Not good. For whatever reason I can’t offer what ‘Baba’ can and today this is a major problem. Drama ensues and Margot is inconsolable. I haven’t seen this before. 11:25 Margot begins to drop off to sleep but keeps reminding herself that she wants “Baba !” And so the cycle of tears continues. Unfortunately, it’s likely to be further punctuated by regular post op observations every 15 minutes. Looks like it’s shaping up to be a long day. 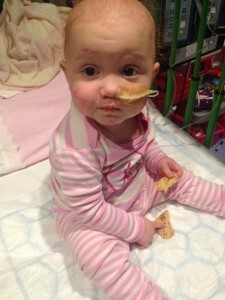 Blood test results show Margot is now “100% donor” so the bone marrow transplant has worked. All the cells are donor cells and this means there is no leukaemia in the marrow. 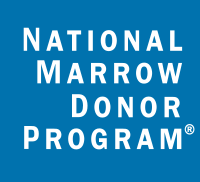 To be absolutely certain we need the results of the bone marrow aspirate from today, but these tests won’t be forthcoming until early next week. Dr Guiliana says it’s now “99% certain that Margot is disease free” but aspirate tests are required to be categoric about this. Margot’s blood will change from O+ to A+ Over the course of the next 3 months. Margot’s TPN dependency is dictated by her feeding. Once she begins to feed orally, we can start to change her meds from IV (Intravenous) to oral. This is our ticket home. It’s all about the amount of fluids and calories Margot intakes each day. Roughly 1 litre of fluid per day is required. Calorie intake to be confirmed by dietician later today so we have some targets to aim at. Oramorph to be reduced to 1ml (from 1.6ml) from 18:00 today (still administered every 6 hours). I call Vicki to tell her the good news. Suddenly, I’m very emotional. As she gives Margot her drugs, I tell Nurse Rosie about our news. 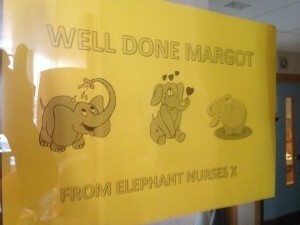 She immediately says “ooh congratulations Margot, you’ve graduated from greens to yellows !” (this is the sign on the door which indicates patient status) and then looking at me (and seeing me in bits) she says “come here you big fish” and comes around from the other side of the bed to give me a big hug. 14:11 Urso administered (helps the liver prevent VOD / blockage of the liver). Given that Margot is now in the “yellows” we can have close family visit and Margot may now even leave her room (for short walks). 15:25 Probenesid administered. Pre-hydration due in 2 hours from now. Not great because this means that Margot will remain hooked up to machines for the next 3 hours (17:30-20:30 or later) and will miss her bath tonight. Nurse Edil says she can unhook Margot now so she can have a little move about. 16:59 Oromorph (1mg) administered. It’s now 5 hours since her last dose & the nurse is trying to get her back into the original timetable (upset by nil by mouth). This is a weaned down dose and will be repeated every 6 hours. Margot is hooked up to pre-hydration fluids for an hour And Ambizone (anti fungal) for half an hour. 18:32 ciclosporin Infusion begins over 1hr 45 mins. 19:45 post hydration fluids infusion begins (60 minutes). Margot’s NG dressing and Hickman dressing are changed. 21:08 Probetcin (post Cidofovir rescue treatment) administered along with two anti-sickness meds. 21:32 Overnight milk feed hooked up (runs for 10 hours). 22:48 Meds fest: Oramorph, Ciprofloxicilin, Amiloride, Urso, penicillin, all administered orally ! Summary of a very good day ! 1. Cidofivir drug appears to be working: Adenovirus test results shows the virus is down to 5,000 copies / ml compared to 40,000 copies / ml previously. Next test for this is on Monday. 2. Successful bone marrow aspirate procedure conducted this morning and good sample taken for testing. 3. Margot’s key blood numbers have stopped falling and have started to climb. This means that her immune system is showing some signs of growing robustness. We now need consistency and stability. More please Margot ! 4. 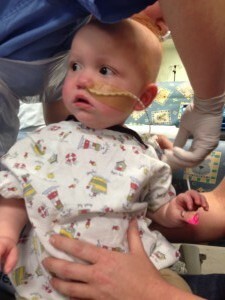 And best of all: Blood test results show Margot is now “100% donor” so the BMT has worked. All the cells are donor cells and this means there is no leukaemia in the marrow. Dr Guiliana says it’s now 99% certain that Margot is disease free but aspirate tests are required to be categoric about this. What a superb day ! « Would you stake your life on a 50/50 bet ?